Many donors support Lower Cape Fear Hospice Foundation as part of their estate plan. These planned gifts or charitable bequests provide care for patients and families facing a tough reality and serve as a lasting legacy for the donor. Establishing these visionary gifts places donors in the Sandy Morgan Society. 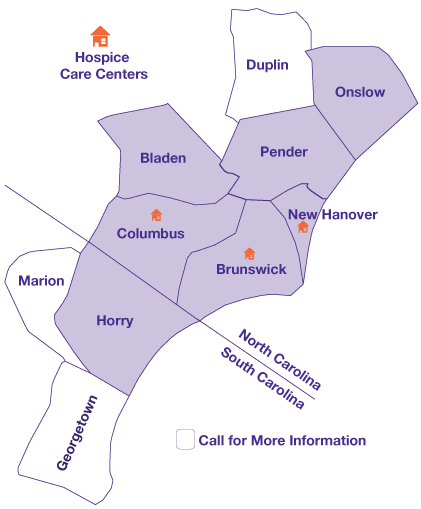 If you have included Lower Cape Fear Hospice Foundation in your estate plan or would like to learn more about the simple process of becoming a Sandy Morgan Society member, please contact us. There are several ways for you to support the foundation. Appreciated securities, bonds or mutual fund shares are an excellent way to provide a gift and maximize your tax savings. In addition to the tax savings, a gift of assets avoids the long-term capital gains tax on the appreciated value. A contract between the donor and the foundation which provides fixed guaranteed lifetime payments to the donor and/or another beneficiary in an amount greater than most certificates of deposit. Support a charity with payments over a specified period of time but have the principal of the trust revert back to the donor or to the donor’s family. Trust arrangements which pay a fixed or variable income to the donor and/or other beneficiaries. Assets such as cash, stock, mutual fund shares or property interests can be transferred to charitable trusts. A trust may be managed by the Foundation or a bank, trust or investment company chosen by the donor. A gift by will or trust is the most frequently used method to make a deferred gift to a charity. Individuals who inform the agency that they have made a provision for Lower Cape Fear Hospice in their will or estate plan become part of the Sandy Morgan Society. When including a bequest or provision in your will. Always use the full, legal name and provide federal taxpayer identification number. Lower Cape Fear Hospice Foundation is the official fundraising organization solely for the benefit and support of Lower Cape Fear Hospice, Inc. Unrestricted gifts will be used for the greatest need at the time to be determined by the Board. A general bequest to Lower Cape Fear Hospice Foundation is especially valued. If you would like to honor a family member, special person or provide support for a specific program or department that was meaningful to you, then you can designate your bequest specifically for that purpose. You simply use any form of the possible language provided on our sample bequest and replace to be used for the benefit of [insert purpose or intent] with the specific designation. Often specific guidelines govern the use of these types of gifts. Therefore, we recommend that you contact us to discuss your restricted gift. We are here to help you. To learn more about bequest and estate gifts, contact Laurie Taylor, Vice President of Development, at 910.796.7944 or email Laurie.Taylor@lcfh.org. Enables a donor to transfer personal property to the foundation, generating financial and tax benefits, while retaining the right to use the property, generally for the remainder of the donor’s life. Policies make wonderful gifts when a policy is no longer needed, the financial significance of the policy has changed, or you do not wish to continue premium payments. A gift of an existing policy results in an immediate income tax deduction. The foundation may be made both the owner and beneficiary of the policy or just the beneficiary. The foundation can be the primary, secondary, conditional, or residual beneficiary in whole or for a part of the policy amount. The Lower Cape Fear Hospice Foundation Endowment Fund provides annual income in perpetuity to support the needs of patients and families in our care. A healthy endowment is perpetually grown and nourished to ensure that Lower Cape Fear Hospice services are never limited by a lack of resources. A strong endowment ensures that Lower Cape Fear Hospice will be strong for all time. Endowment is often called “the gift that keeps on giving” and when added to the annual support we receive from generous donors, ensures the quality and availability of hospice care and services. Endowment gifts are invested to preserve the value of the donor’s contribution and to generate annual income needed to serve our community. Investment policies guiding the selection and performance of investment managers, and all decisions regarding expenditure of income are overseen by the Foundation Board of Trustees. A gift or estate bequest of $25,000 or more will establish a named endowment fund. Creating an endowment at the Lower Cape Fear Hospice Foundation creates a legacy that upholds your ideals and beliefs in perpetuity. An endowment is a permanent fund dedicated to endowing your annual gift to Lower Cape Fear Hospice Foundation. This is not intended to take the place of your annual gift; it is instead to create a lasting legacy that will continue to make the same annual gift to support our mission in perpetuity for generations on your behalf. To determine the estimated amount you will need to endow your current annual gift, simply multiply your current annual gift by 20. Alternatively, you may endow a portion of your gift now by establishing a Generations fund today, perhaps building up the fund through subsequent contributions over time. When including a bequest provision in your will, always use the full, legal name and provide the federal taxpayer identification number. Lower Cape Fear Hospice Foundation Endowment Fund is a 501(c)(3) tax-exempt public charitable organization that manages private funds to advance the mission of Lower Cape Fear Hospice, Inc.
Our federal taxpayer identification number is: 56-1391849. A personal residence, a farm, a vacation home, commercial building or undeveloped land may be given in whole or in part using various tax-advantaged methods. Sandy Morgan was our first hospice patient in 1980. Beautiful in person and spirit, she dedicated her life to helping others by enrolling in nursing school and planning to join the Peace Corps. She was 28 years old – a vibrant artist, dedicated volunteer, and courageous patient. Her life is a legacy. Since her time with us, we have served thousands and thousands of patients and families. Sandy’s spirit and her joy for life is still part of our organization today. It is with the utmost honor and respect that we remember and celebrate her legacy through the Sandy Morgan Legacy Society. While many donors want little in return for their generosity, planned or estate gifts provide advantages to you as well as to Lower Cape Fear Hospice. Your charitable contributions can maximize your personal objectives while minimizing your tax costs. Tax benefits for planned gifts vary by situation and implementation. Please consult a legal and/or tax advisor to determine the benefits for you and your family.